Do I Really Need Glass Break Monitoring? While most home security customers understand the value of their motion detectors, some are unsure about the necessity of their glass break detectors. Why do you need glass break detectors in a home security system? Aren’t motion detectors enough to stop an intruder in his tracks? In some cases, yes – but if an intruder breaks the glass on a door or window, it’s often the glass break detectors that stop him from going any further. Why Would a Burglar Break Glass? 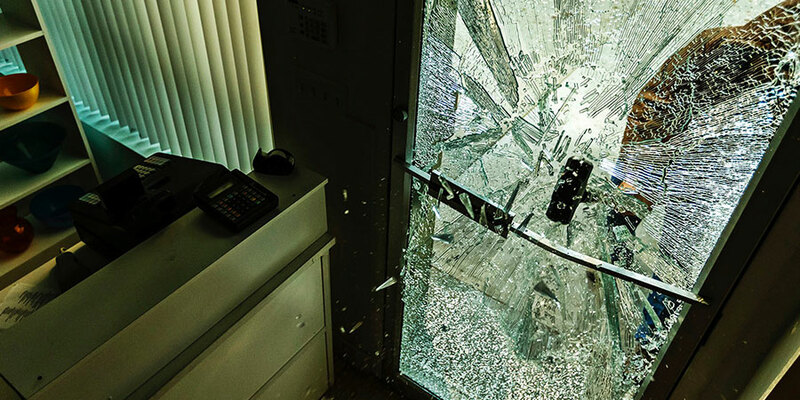 In the minds of many people, breaking glass during a crime is most often associated with business break-ins: from smash-and-grab burglaries in their communities, to large-scale heists in the movies. True, those scenarios do involve broken glass more than residential break-ins. But broken glass in a home burglary is certainly not unheard of. When a wood door has a glass window panel (even a small one), a burglar may see that as his ticket to getting the door unlocked. All he has to do is quietly smash the glass, reach in and unlock the door from the inside. And of course, a sliding glass back door is another entry point that is highly vulnerable to being broken by an intruder. In both these scenarios, the criminal can be stopped in his tracks by the glass break detection in the security system. How Does Glass Break Detection Work? Glass break detectors are powered by sensors that instantly pick up the sound and vibrations of breaking glass and trigger the alarm when those cues are received. Effective glass break detection features dual shatter recognition technology and advanced signal processing, which reduce the risk of false alarms. False alarms are not just a nuisance; they can lead to real consequences with police departments and other municipalities. An older system may not contain this technology to reduce false alarms, in which case the homeowner should consider upgrading. Glass break detection is one of the most important components of home security. Homeowners who are interested in updating to more effective glass break detection and other home security technology can contact GuardMe Security for more information. We will be glad to speak with you. For information on upgrading glass break detectors and other home security equipment, contact GuardMe to request a no-obligation consultation.